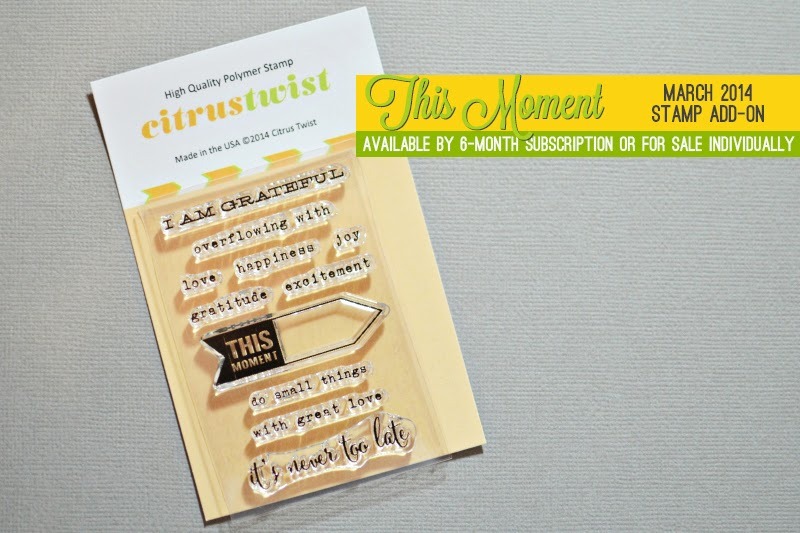 Citrus Twist Kits | Blog : March 2014 Kit Reveal at Citrus Twist Kits! Beginning today the Citrus Twist Kits facebook page is now a Citrus Twist Kits fan page. We invite you to share what you are doing with your CT kits. If you'd like to add our page to your facebook feed, you'll find lots of inspiration from you, our subscribers, and our Design Team. Subscribe to a Main or Pocket Life kit. Choose a free Main kit from September, October, November or December and leave your top 3 choices in order of preference in the comments section at checkout. Did one of our subscribers refer you? Please leave their name in the comments section at checkout--along with your free kit selection--so they get a free kit, too. Your free kit will ship with your first kit. Current subscribers who refer more than one Main or PL kit subscriber can earn multiple free kits. This free kit offer is while supplies last during the month of March. In April we are offering a self-paced class on Pocket Life focusing on taking the stress out of and putting the fun into your PL pages. We want you to be guilt free and smiling when you are working on your PL. This class will be brought to you with contributions from multiple designers on our team. The CTK Store is stocked with new CHA items and we are still adding more items. Did you know your 13th consecutive month kit with us is free? You just pay shipping! Are you ready for reveal? Here we go! We'll begin with this month's Main kit "Fireflies." "Just Cruisin'" is March's Pocket Life kit. 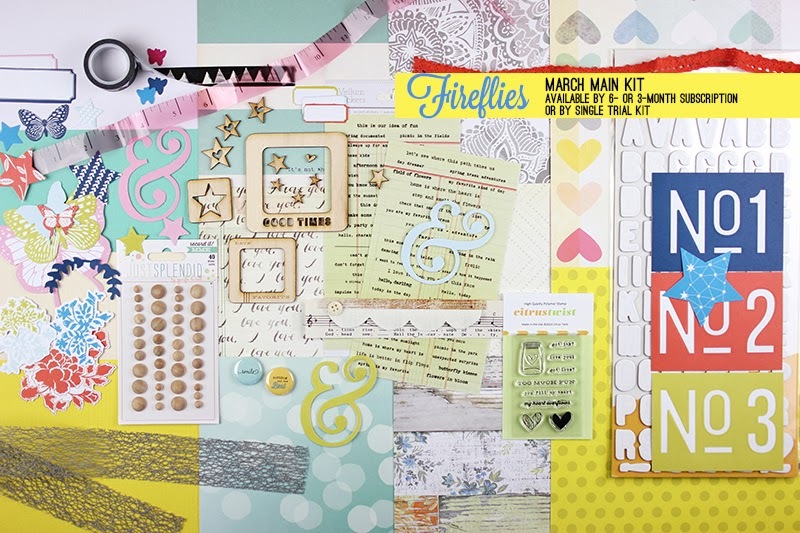 We are loving the Dear Lizzy Daydreamer paper pad, the DIY Shop cork arrow stickers and those wonderful kraft alphabet stickers from Elle's Studio. 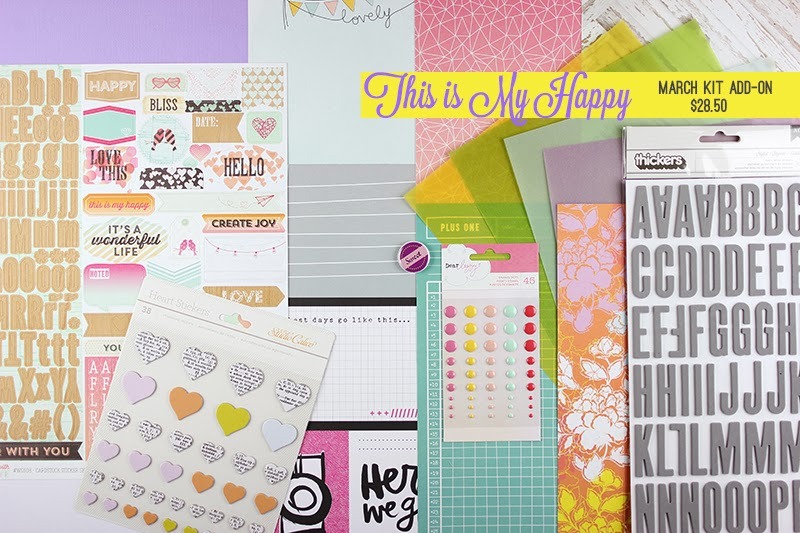 We've gone almost tropical this month with our "This is My Happy" Kit Add-on. 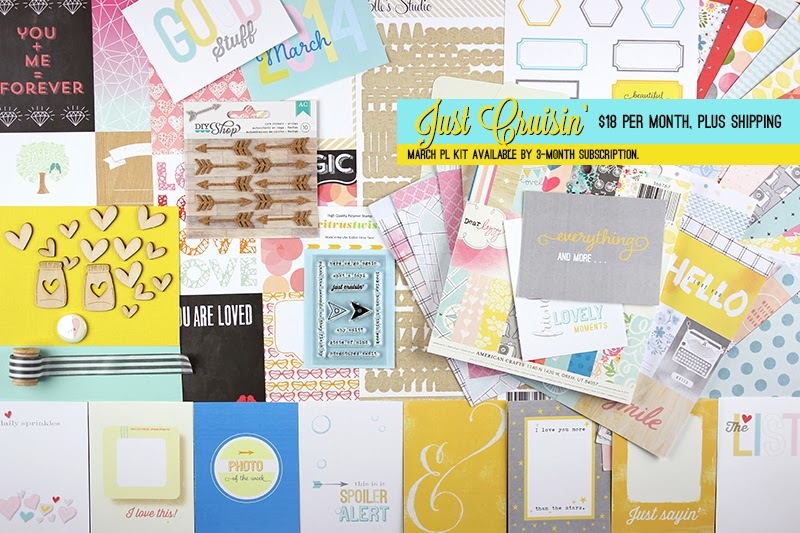 March's stamp subscription or add-on is "This Moment." You can fill in the message "overflowing with . . . " by substituting out the different choices. 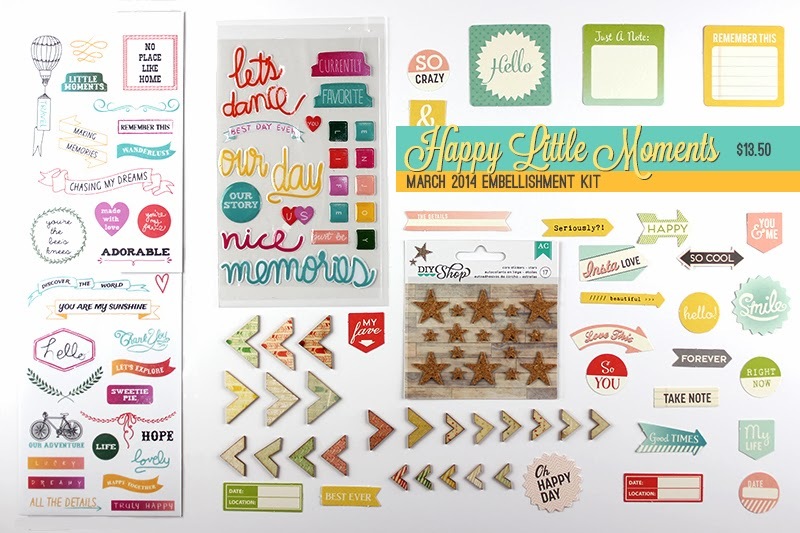 You'll have lots of "Happy Little Moments" with our action-packed embellishment kit. This kit almost sold out during our subscriber presale. 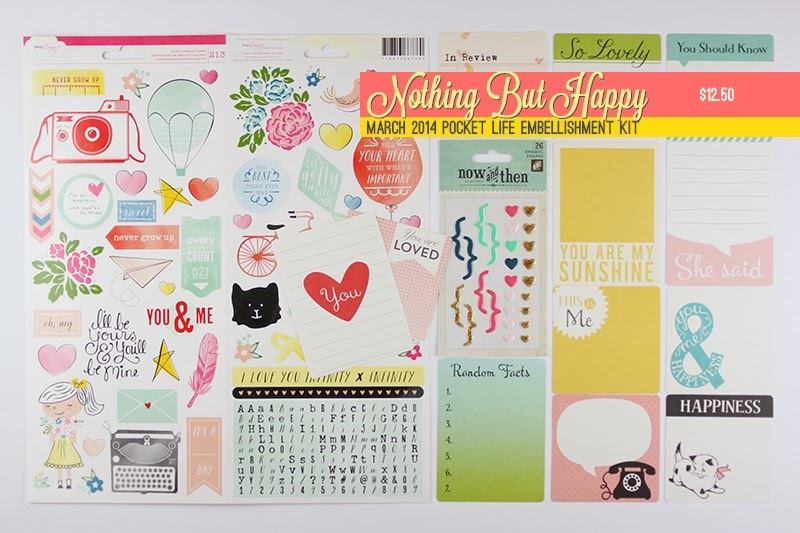 "Nothing But Happy" is a delightful blend of fun colors, alphabet stickers and embellishments. This Embellishment kit is now sold out. 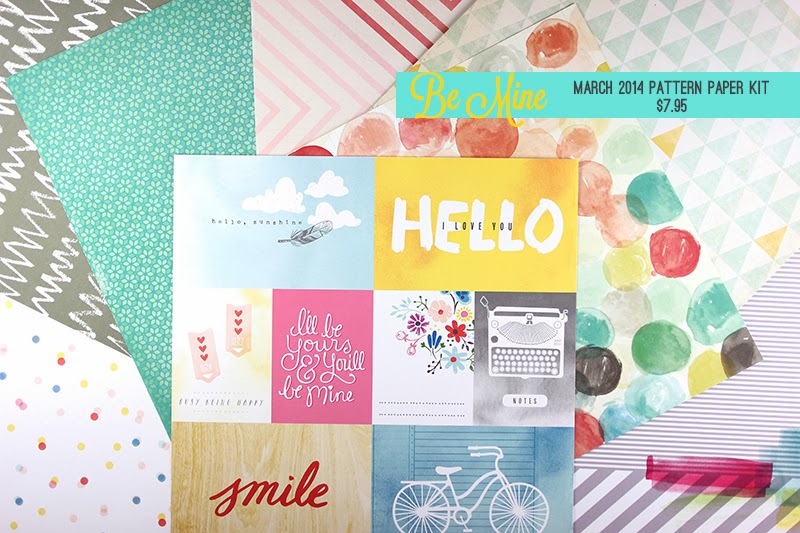 We couldn't resist this blend of happy colors in our "Be Mine" Pattern paper kit. "Be Mine" is sold out as well. Every month we bring your our Solid Paper kit. 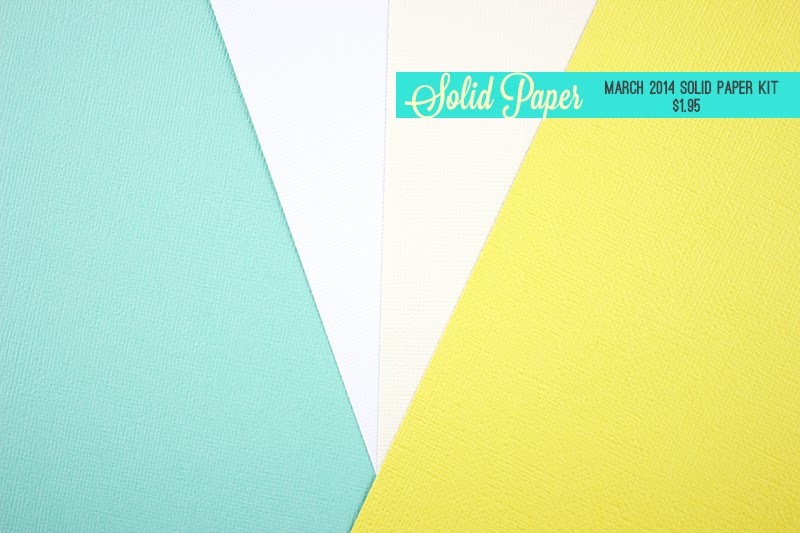 The Solid Paper kit serves to double your cardstock from your Main kit and blends with our Pocket Life kits, too. If you have leftover 6 x 6 paper from your Pocket Life kit, picking up a Pattern Paper and Solid Paper kit leaves you with lots of scrapbook page possibilities! For those of you who like viewing our kits reveal via YouTube, Design Girl Melissa Stinson has made a movie for you. Here is the link. Enjoy! We look forward to a month of beautiful project shares from our subscribers. Be sure to upload your work to the Citrus Twist Kits Facebook page, as well as our Gallery. Watch for our Sunday Sketch challenges to be posted weekly on the fan page, too.